If you use weapons for sport at a shooting range, or for hunting, your weapons need to be securely stored. Below are just some of the different storage styles, as well as some handy weapon storage accessories. Whether you are legally required to or not, securing your firearms in secure weapon storage lockers is a good idea for several reasons. First, it allows you to organize your collection if you happen to have several weapons, and allows ease of access when needed. Second, it makes it harder for someone to steal your weapons, gives you peace of mind. And if you have kids, it prevents them from dangerously accessing them without your authority. These are a few basic types to look at, which one you go for depends on your needs. 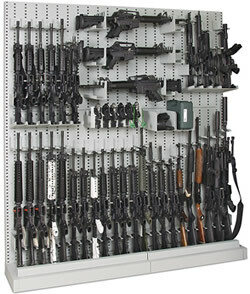 Open type weapon storage is primarily used for organization. There are no doors, no locks and generally nothing to prevent someone from walking up and taking a firearm in one. 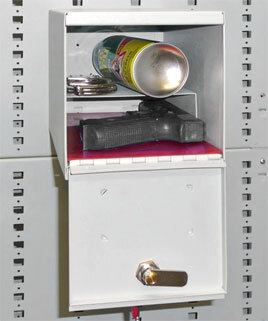 This is also a good type of storage for people who want to have easy access to their weapons. If being able to quickly get ahold of your firearm is a big concern, you may want to look at purchasing on of these open style weapon storage racks. You can always put the open storage in a special room with a secure locking mechanism to add in some safety while being able to access your weapons relatively quickly. Many ranges, pawn shops and other types of establishments with varied and extensive collections favor this type of weapon storage system. While it’s not really a recommended weapon storage method for a home, especially if there are children around, some weapon enthusiasts, or law enforcement professionals may have a considerable collection and a dedicated secure room. In such case this convenient open storage might be ideal. By locker we mean wall lockers. This weapons storage option is great for people who have multiple rifles, shotguns and other long guns. They can also often store plenty of ammo in them as well. These will be a good option for people who have multiple firearms and ammo who do not have a dedicated secure room in their house and also for people who have children whom they don’t to access the guns. With a little work these lockers can be hidden in a wall, behind a painting or mirror, allowing quick access when needed, but still hiding the “locker” look. These are small, often wall mounted, boxes suitable for one gun, usually a pistol and a couple magazines. They are perfect for someone who simply has a handgun they want to store securely and safely. They take up very little room so it is possible to buy multiples if you want extra space or organization. These are also often used in conjunction with more complicated weapon storage systems and can be repositioned as needed. A simple online search will yield plenty of results about different types of hidden home storage ideas, and the small size of the storage boxes makes them perfect for hiding safely out of sight. Keeping your weapons in good order includes properly storing them and the accessories needed to operate and maintain them, shop around and find the best storage system for you.